Today's post has absolutely nothing to do with crafting. 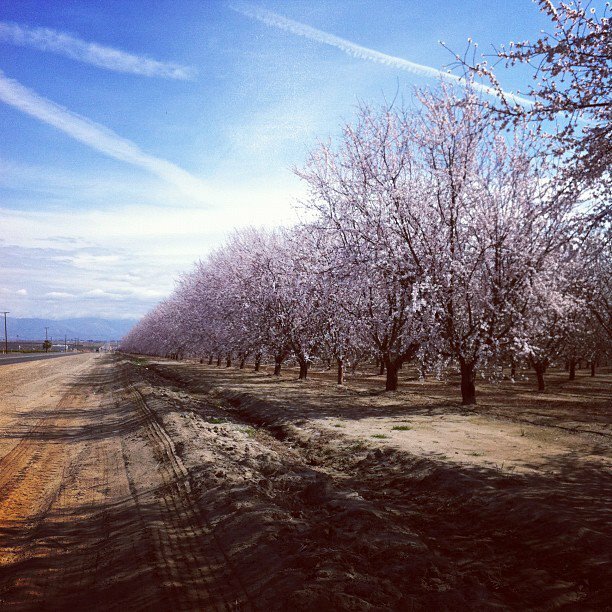 But when you drive from the Central Coast to Nevada (out by Arvin) you drive through a lot of orchards. I have never seen them in this stage of blooming. Absolutely beautiful white and pink buds. So on with the story... we went to Vegas for a couple days with some friends. We saw a show, slept in, did some shopping (okay, a lot of shopping) and ate some great food. I know, we're probably the only people on earth that go to Vegas for shopping and good food but that's what we did. We did something that I have always wanted to do and it was not the Zip Line in old downtown or the roller coaster on top of the Stratosphere. 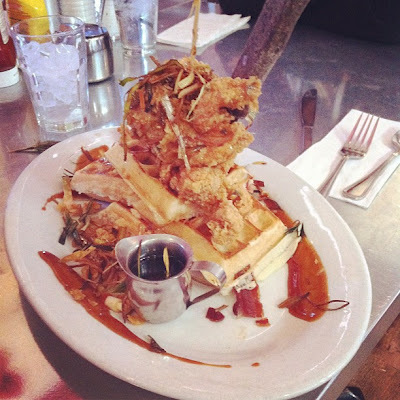 We went to Hash House a Go Go. We have heard about this place years ago and have never gone. 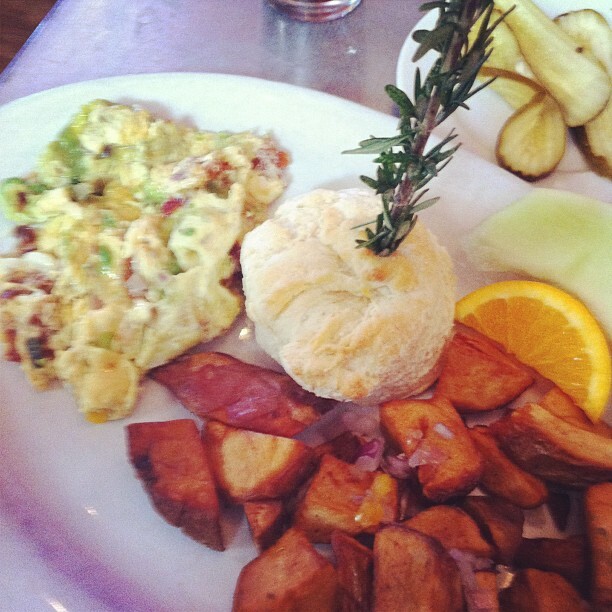 Hash House is about 5 minutes off the strip on Sahara (there are other locations in Las Vegas and San Diego, Ca). The wait was about 30-40 minutes at 11:00 in the morning but it was worth the wait. Just all around super fun place. They have a huge menu...We thought O'hare of the Dog was hilarious. Only in Vegas would you see that. We all laughed so hard at the pure size of some of the food that you really have to see to believe. Everyone around us was laughing and having a great time. I think that's a sign of a great restaurant. FUN. 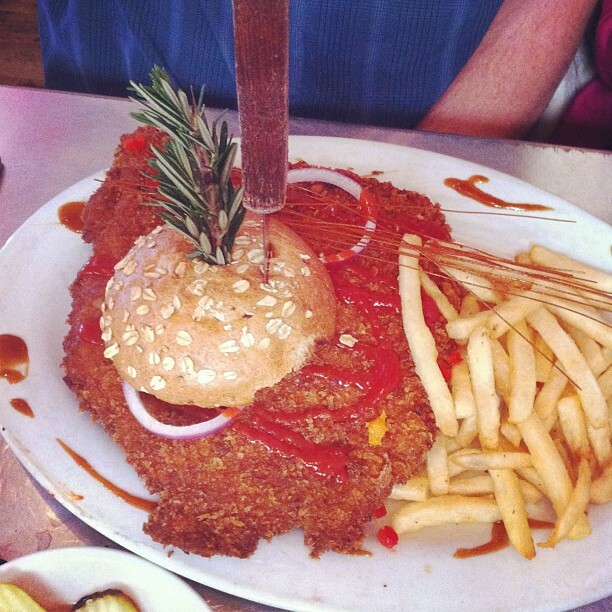 This was our friends Pork Tenderloin Sandwich (from the lunch menu). We couldn't stop taking pictures of it (in fact if you watched other tables, everyone was taking pictures of their food). This was the chicken and waffles. None of got this, but the guy at the next table did so I just asked if I could take a picture of it before he cut into it. He said he had come from Chicago and couldn't go home without having it. Mine was a very nice size farm scramble with a biscuit. But the hit of the day was my friends Brown Sugar Banana Flapjack. We all got at least one bite to try it. 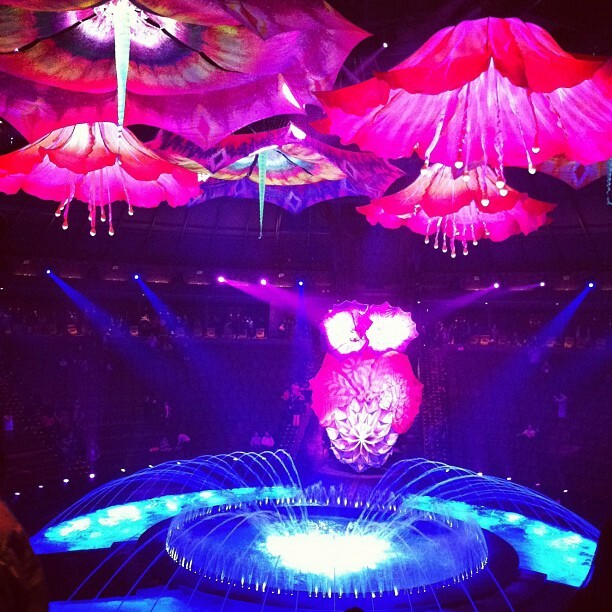 FAB-U-LOUS! I would go there just for this. She decided she wanted to try and recreate these at home for her family so she found this video on You Tube that shows the executive chef of Hash House a go go creating the exact flapjack (and some helpful tips). Then we found a recipe for Buttermilk pancakes at allrecipes.com . Of course if you have a favorite buttermilk pancake recipe, use it. click here for the rest of the recipe and to print it. And this past weekend we stopped by her house to taste the results. Not exactly the same batter flavor of course but really, really good. Honestly no butter or syrup was needed (so sad I didn't take a picture). And even though she made them a much more manageable size, she still used a barbecue spatula to flip it. By the way, here is the full menu. My husband and I go to Vegas for eating & shows. (He lays at the pool while I shop). I've never tried this restaurant, will be sure to next time. I've always wanted to go the Vegas but I'm not much of a gambler. 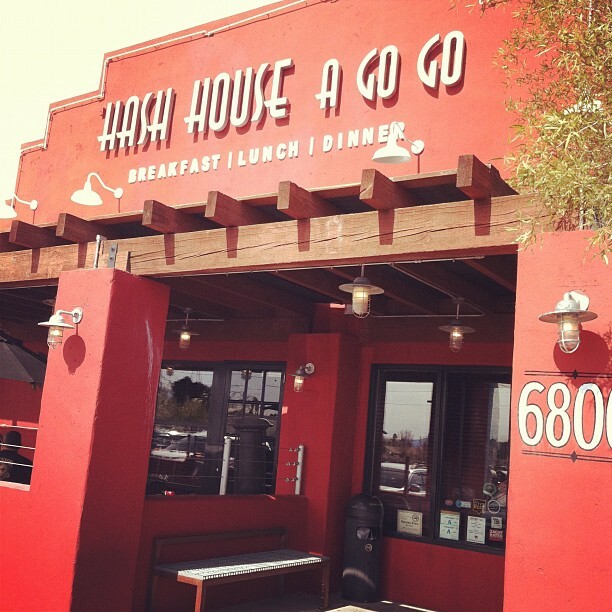 I guess I need to go just to eat at Hash House A Go Go! The food looks delicious! We got to Vegas once a month and we always stop at the Hash House! There food is amazing...the chicken pot pie is outa this world!!! and huge! We'll have to stop there next time we go through. 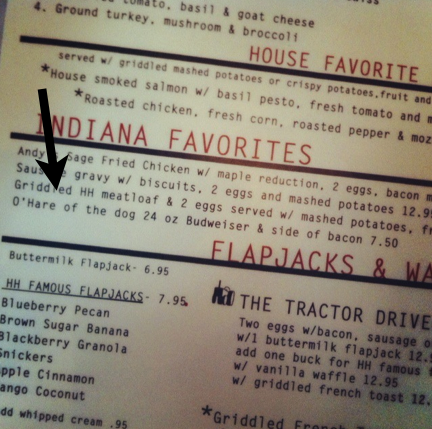 That pancake sounds delish.